Musa Kart was announced as the 2018 laureate of the International Press Cartoon Prize by Cartooning for Peace. The 2018 International Press Cartoon (or Drawing) Prize, presented biannually in Geneva, was awarded to the Turkish cartoonist who was recently sentenced to almost four years in prison for “aiding terrorism”. 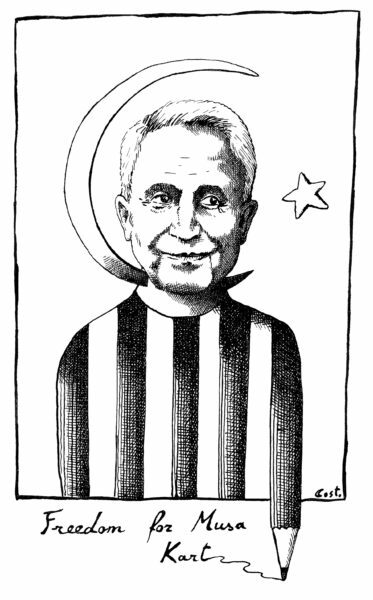 He is a 64-year-old artist working with the Turkish daily newspaper Cumhuriyet and was described as a “free spirit and a remarkable artist” by Swiss cartoonist Chappatte, a member of the jury. It was also the day of the presentation of the first Ari Rath Prize for Critical Journalism (established to honour journalists who have rendered outstanding services to critical reporting on immigration, expulsion and asylum, committed to respect for human rights, in the spirit of the former editor-in-chief of the Jerusalem Post, who died in January 2017). 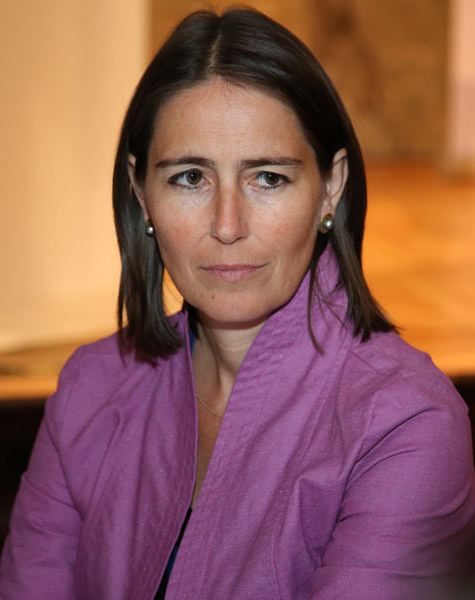 Austrian journalist Alexandra Föderl-Schmid was the laureate. Alexandra Föderl-Schmid who helped shape the daily newspaper “Der Standard” for almost three decades. / Picture: © Wikimedia Commons / Franz Johann Morgenbesser. 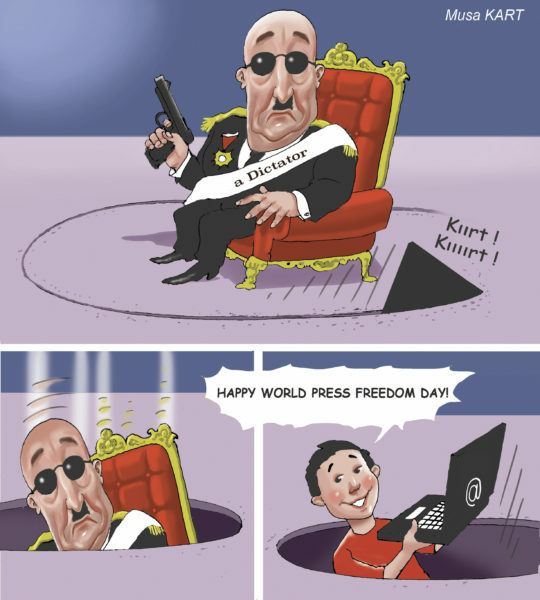 The Stockholm Center for Freedom (SCF) partnered with the London-based International Observatory of Human Rights (IOHR) to commemorate World Press Freedom Day in Stockholm with an event focused on Turkey, which leads the world in the highest number of journalists in jail. According to SCF data, 258 journalists and media workers were in jail as of today, with 59 of them already convicted on dubious charges of terrorism, defamation and coup plotting. In addition, 142 Turkish journalists who were forced to go into exile or still remain at large in Turkey are wanted for arrest by authorities. Nine NGOs wrote on World Press Freedom Day a joint letter expressing deep concern over the continued arbitrary detention of Tashi Wangchuk, a Tibetan language advocate arrested in 2016 after giving an interview to the New York Times. Tashi Wangchuk has since been tried for “inciting separatism,” a politically motivated charge that violates his rights to freedom of expression and association. [Tashi Wangchuk began raising public concern for the lack of rightful Tibetan-language education …In late 2015, he spoke with the New York Times in an interview about his attempts to promote the teaching of Tibetan; he insisted the interview be on the record. A journalist from the New York Times also accompanied him to Beijing, where Tashi Wangchuk attempted to file a lawsuit to ensure local authorities guarantee the provision of Tibetan language education. The result was an article and video documentary featured in the New York Times in November 2015. And then there were many smaller events all around the globe that also deserves attention, such as Amnesty International Nepal voicing support to journalists as human rights defenders (such as Charan Kumar Prasai and Subodh Pyakurel and Rajan Prasad Kuikel). Trailer for Human Rights Watch Film Festival in London. From 7-16 March, 2018, in London. true heroes films (THF) published on 3 December 2017, an updated version of its trailer.